Supernova Mario Bros 2 Engine is supernova's 4th open source Mario engine (codename: Carrot) based on Super Mario Bros 2. 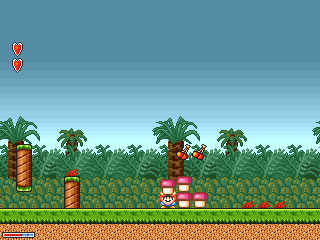 Unlike Hello's SMB2 engine, Supernova Mario Bros 2 Engine has better functionality and well organized coding system. All the basics from SMB2 are complete. Supernova did plan for some expansion but later on he decided to be against it due to clones. All future expansions are cancelled but the author himself might help some GML programmers out. The subspace system was programmed by xn--e5x, who mysteriously appears on the old MFGG forums and dropped it there along with modified Hello Engine 3. Though the engine was lost for a while until Supernova reuploaded it on the main site.